It’s with great sadness and some relief that I say goodbye to my Mother, Jean Schappet. She had been battling a rare condition called PML, Progressive Multifocal Leukoencephalopathy. Jean passed away, July 28th at 7:30am she was 61 years old. We will be having a Memorial Service for Jean, August 9th 1:00pm at The Lutheran Church of Our Savior in Bryans Road, MD 7365 INDIAN HEAD HIGHWAY BRYANS ROAD, MD 20616 301-375-7507 Jean Ann Schappet, 61, of LaPlata, Maryland, went home to her Savior on July 28, 2014 at home with her family. Jean was born April 10, 1953 in Borne, Massachusetts to Robert and Jean Blevins. In addition to her parents, she is survived by her siblings, Robert and Dawn Blevins, William and Susan Blevins, her husband, Charles Schappet, her daughter, son-in-law and granddaughter, Patricia, Jay, and Shelbi Stine, her son and daughter-in-law, James Schappet and Tina Tootle. Jean dedicated her life to creating opportunities for ALL children to achieve their highest potential through play and thrive together. 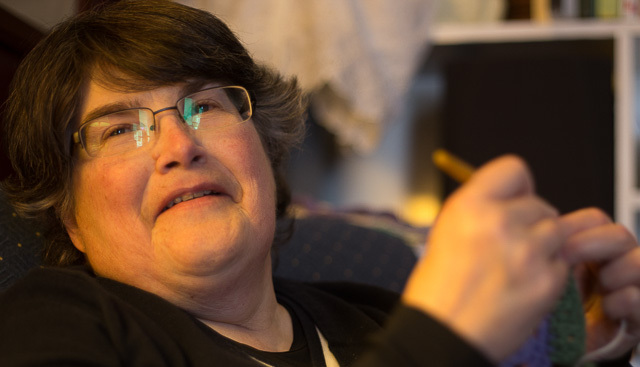 Jean worked as a Play Advocate for over three decades. During her career, she was a driving force behind Woodset, Boundless Playground and Pure Play Workshops. She also served on several safety boards, including National Program for Playground Safety and ASTM committee developing national playground safety standards. Jean was active in her local community, serving on the local Planning Commission and Appeals Board, and Rotary Club (LaPlata). Her highest joy was to serve in the children’s ministries. Most recently Jean was lovingly referred to as “The Story Lady” by the preschool children to whom she shared her faith . She loved to knit and crochet; she was constantly designing new patterns for everything from dishrags to doll clothes. She loved to camp, ride her motorcycle, read non-fiction, collect pottery, and spend time with her family – both relatives and “adopted” members. She was greatly loved and will be greatly missed by everyone who knew her. Memorial contributions may be made to the children’s charity of your choice. For additional details contact: Raymond Funeral Home.